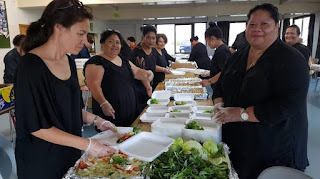 The kāinga of Crown Prince ʻUlukālala Tupoutoʻa from Vava’u prepared 4000 clamshell plastic bowls of food for refreshment as part of the memorial service for the Queen Mother last night. The death of the Queen had brought together the Tongan kāinga in Auckland according to their ha’a or how they are linked to the royals in blood and duties. Kaniva news reports some of the ha’as were given the roles of preparing food to feed people who were tasked with keeping vigil around the Queen’s casket in ‘Atalanga. This included feeding people who gathered in mourning at the memorial services organised for the Queen, which began Wednesday night at the Tuingapapai church. Prince ‘Ulukalala’s ha’a, from his estates of Tu’anuku and his estates of ‘Utulau and Nomuka because of his Tupouto’a title, will be feeding the mourners tonight. The Tu’anuku kāinga met on Tuesday with Princess Mataʻaho Jr as Prince ʻUlukalala was in Tonga. Only six people turned up to the meeting and there were fears that the number would not be able to donate enough to feed the hundreds of mourners who could turn up to the memorial services. But one of the attendees, Siosiua ʻUmulovo Toki, reminded the meeting “there was nothing big” for Vavaʻu. “That’s the Vavaʻu way,” he said. “We are a people with big heart and we always do our best in everything we do to make sure we do not lose or go down in the world”. The meeting was attended by Prince ʻUlukālalaʻs immediate family, including the Toki, Tapueluelu and the Heletā lineages. Sālote Heletā Lilo, who represented a newly committee established to look after the Prince’s Tu’anuku kainga in ‘Aotearoa, said people from other estates of the Crown Prince had donated money and food. “The Prince’s kāinga from Nomuka donated 400 bowls”, Lilo said. Kaniva News was at Lotofaleʻia Methodist Church yesterday where the preparation of food took place. About 30 people there were warm and happy while they were preparing and packing thousands of bowls ready for the reception. Last evening was the second night of the Queen’s public memorial service in Māngere. The Queen Mother’s body will be returned to Tonga on a Royal New Zealand Air Force C-130 Hercules. A spokesman for RNZAF Whenuapai in Auckland said about 20 mourners, including several members of the Tongan royalty are expected to accompany the casket from Whenuapai airfield. The Hercules was expected to leave in the morning and arrive in Tonga in the early afternoon. The Queen Mother will be taken to the Royal Palace in Nuku’alofa for a public takipō in which the people will be allowed to pay their respects.